The TriFly is not a toy or a novelty amp! It is a point to point, all-tube, one-channel amplifier with Volume control and Power switch and both 4 & 8 ohm outputs (16 ohm optional). It uses a 12AX7 Preamp tube and a 12BH7 dual Triode high current Power tube, in self-spit push pull mode, running a little “hot” to deliver more symmetrical clipping. 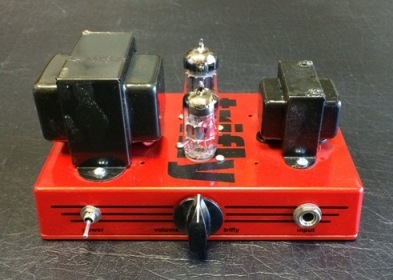 The TriFly uses custom Heyboer transformers and a Conjunctive Filter is incorporated into the output stage to smooth out the overall response. A classic power supply is used. Played on a Strat with Joe Barden pickups, the amp starts to break up at about 4-5. Dimed it really barks. It sounds excellent. There's really no need for a tone stack as you can control everything from the guitar. Having 2, full-size 9 pin tubes means interchangeability with both new stock and NOS tubes if you are searching for that special tone. Use the supplied 12AX7 or swap in one of several lower gain preamp tubes or switch from the supplied 12BH7 to 12AU7 for even lower power. The power supply is not a low cost, unserviceable, switching or charge-pump design popular in many small amp designs which means it is serviceable and generates no radio interference. The point-to-point wiring means your tone can be tweaked to your complete satisfaction using classic design techniques and the Red Sparkle enclosure is a dual-pedal size that can fit in your kit bag! The eyelet board for the TriFly is a new design approach. Full size tube sockets are located in the middle of the chassis and large access holes through the eyelet board allow easy component connection to the pins. The tubes are aligned so the heater connections are closest making it a very compact and quiet design! Point-to-point wiring means optimal service and reliability. High-quality tubes, sockets, coupling capacitors and resistors are selected for tone, performance and reliability. The Trinity Amps Heyboer power transformer and output transformer are all custom built and designed with maximum tone in mind. The special, large design Output Transformer gives the TriFly an excellent bottom end with a thicker sound and also it has fantastic clean tone at low levels making it sound huge. No other small amp sounds so big! !